The Ashstack 1012 bale stacker from Ashmore Engineering can load and stack 5 or 6 bales in a single row and 10 or 12 bales in a double row. The design involves a clamp mechanism which is on the side of the machine that picks up bales on the long side. This allows the Ashstack 1012 to be stacked immediately after they leave the baler therefore reducing the risk of damaging the bale through increased exposure. The bale stacker can pick up bales either on or off the string and can be stacked like this too. 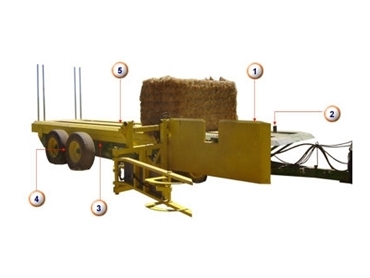 Because the Ashstack is semi automatic, the bale retrieval process is fully automated however the final stacking process of the bales is manual which allows the operator control.